A science fiction horror drama, Alien: Covenant continues the origins story chronologically preceding the first film. Covenant is a jumble of recycled content, lacking in thrills, scares and fresh ideas. 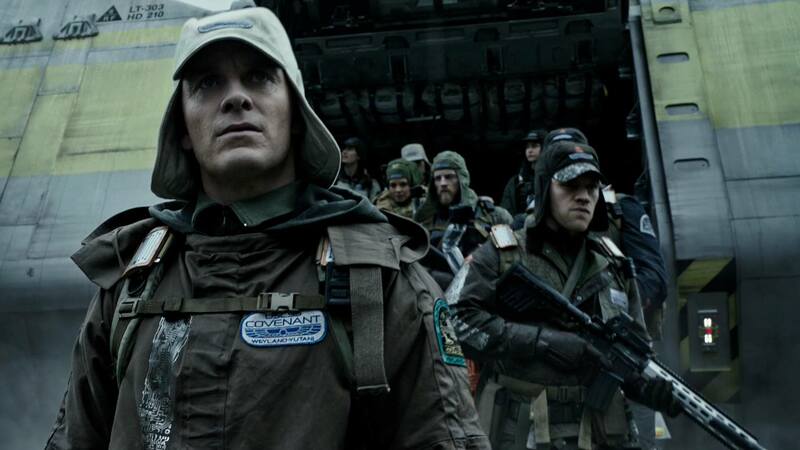 In a prologue, the synthetic David (Michael Fassbender) from the Prometheus story converses with his creator, business magnate Peter Weyland (Guy Pearce). David has strong self-awareness and surmises that his ability to out-survive humans makes him superior. Eleven years after the Prometheus expedition, the starship Covenant is on a journey to start a colony on the distant planet Origae-6, with 2,000 colonists in stasis and more than one thousand embryos. With seven years of travel remaining, the Covenant is violently buffeted by a stellar burst and the captain is killed. 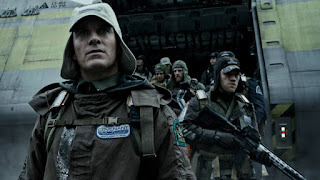 The on-board synthetic Walter (also Michael Fassbender), a more advanced version of David, helps the surviving crew members, including the new Captain Oram (Billy Crudup), Daniels (Katherine Waterston) and Tennessee (Danny McBride) to repair the ship. The crew receive a distress signal from a nearby but previously unknown and highly inhabitable planet. Oram diverts the mission to the promising new destination, and leads a landing team to explore the surface. Soon a couple of crew members are infected by dust-like spores and violently killed by aliens that emerge from their bodies. With the landing crew having trouble communicating with the orbiting Covenant, Oram, Daniels and the others are saved by the sudden appearance of David, who survived the Prometheus mission and has mastered the art of co-existing with the aliens. 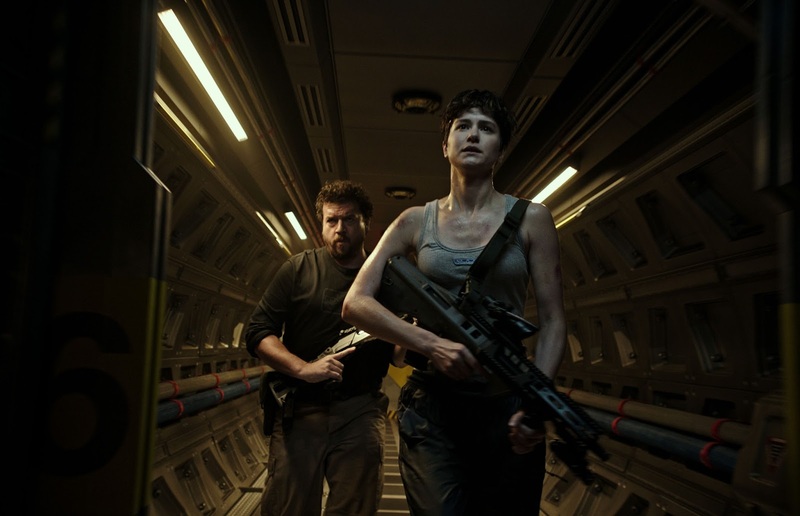 Directed by Ridley Scott, Alien: Covenant often looks gorgeous but is otherwise a laborious and inferior retread of the same old plot elements. A spaceship isolated in deep space. A crew dealing with internal tensions. A distress signal from an unknown planet. A cautious exploration of the surface. A discovery of a crashed vessel. Cue the face huggers and body bursters. This is a franchise rehashing ideas introduced nearly 40 years ago, wrapped in a new skin but unable to hide the lack of substance. The series has moved from genuinely frightening and difficult to destroy villains to lightweight philosophical dissertations about creation and the enduring value of humans. In the process the aliens have become an irritating sideshow in their own movies, trotted out at regular intervals to cause some havoc before being bundled back into their box. The two roles for Michael Fassbender acknowledge the series' strongest point, and condemn how little it has to offer. Scott capitalizes on his main asset, and the actor delivers with two complex characters. David, representing a wrong turn in the programming of synthetics, harbours a serious God fetish and finds plenty of alone time to experiment with designing perfect creatures. Walter is an advancement and a retreat, more focused on serving his human creators. In both incarnations Fassbender dominates the screen with quiet authority. The rest of the characters are watered down and unimpressive derivations from previous chapters, neither Billy Crudup as Oram nor Katherine Waterston as Daniels bringing much that is new. The one neat little twist is plenty of marital pairings among the crew members resulting in elevated panic as spouses are placed in peril. Alien: Covenant may be a new ship with some new faces, but it covers the same old space.